Thanks to Fran Lytle of Brand Champs for this fantastic guest post! At that time, there already was an annual feeding program started by a gentleman in our church. Every October and November, George would purchase food and collect food donations to put together “Harvest Baskets.” George, his wife and another couple packed up the bags of food, which were delivered to food insecure households the Monday before Thanksgiving. The baskets included an abundance of fresh and non-perishable food for the holidays. The number of households varied each year as some people asked to be added to the list and some asked to be removed based upon changed circumstances. But, the list was usually around 50-60 people. George decided to move away from this program because he felt a calling to work in another area of ministry. Since he knew Bill and I were active volunteers in feeding programs, including Rise Against Hunger, he asked if we were willing to take over the “Harvest Basket” program. Bill and I were avid supporters and volunteer coordinators of Rise Against Hunger - an international hunger relief organization that distributes food and life-changing aid to the world’s most vulnerable, mobilizing the necessary resources to end hunger by 2030. As volunteer coordinators for Rise Against Hunger food packing events in our community, we actively recruited volunteers, did the necessary fundraising to purchase the food and each year packed over 10,000 meals for malnourished children in third-world countries. 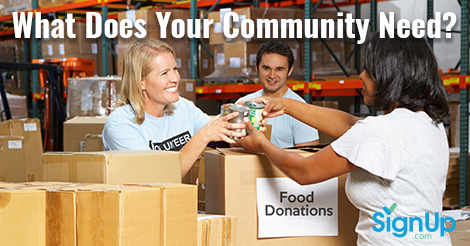 We did this for 4 years, but when Rise Against Hunger had some organizational changes, we decided to get involved in a local feeding program in our community. So, when George asked if we were willing to be volunteer coordinators for “Harvest Basket,” we enthusiastically accepted! First, we called all the people on the list to introduce ourselves and to ask if they would still like to receive a “Harvest Basket,” and updated the list based on new names and those requesting to be removed. Then, we used the same system that George had used for so many years - purchasing food, collecting food donations, packaging and delivering the food. When people received their “Harvest Baskets,” they were so grateful and most of them asked the deliverers to stay and talk with them for a while because they were lonely. Bill and I realized this feeding program was doing more than providing necessary food … it was also providing much needed fellowship. That’s when the big AHA! moment occurred. We recognized that these people needed food more than once a year and they needed to socialize with other people. And, Manna Café, Chincoteague Island was born! The plan was that every Monday, we would serve a free hot lunch to people in the community. The food would be freshly prepared by Bill, using recipes that our family really enjoys. We would also have a “Take Table” where our guests could take home food and toiletries. Although the lunch would be free, we would gladly accept donations to help us fund Manna Café Chincoteague Island, VA.
First, we proposed the idea to our church, asking for permission to use the kitchen and social hall every Monday. They approved our request but informed us they wouldn’t be able to provide any financial support … Bill and I would have to do the necessary fundraising, volunteer recruitment, cooking, serving, cleaning and marketing. We shared this idea with a friend who is also passionate about feeding programs and he asked how much money we needed for the first two months. We told him and he wrote a check right then. Bill and I walked off the cliff, beginning all the start-up tasks in October – December of 2016 with the goal of opening Manna Café Chincoteague Island, VA., with a team of recruited volunteers the first Monday in 2017. Our first year was an exciting, scary and fun experience. We promoted Manna Café Chincoteague Island, VA. to the entire community letting people know that all were welcome. Our guests are of all ages, income levels, races and ethnicities with varying degrees of food and/or social needs. The first Monday, we served 16 guests. By June we were serving 300 – 350 guests each week. We served a total of 11,919 lunches last year! With the help of 20-25 dedicated volunteers, we continue to serve weekly free hot lunches to our guests and are continually searching for new ways to serve our community through Manna Café Chincoteague Island, VA. including a toy drive during the holidays, a coat drive during the winter and partnering with the local health clinic to have nurses answer our guests’ health questions. OK … now, so what do you think your community needs? Instead of waiting for someone else to start a program to address those needs, step up and get it started. You can do it! By the way, we highly recommend using SignUp.com for volunteer recruitment, scheduling and management. It’ll save you lots of time and frustration! Fran & Bill Lytle are the Co-founders & Directors of the non-profit feeding program Manna Café CI, Inc. in Chincoteague, Virginia and the brand strategy group Brand Champs.